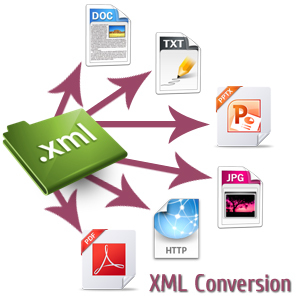 XML (Extensible Markup Language) is becoming popular for its web-publishing format. It is useful for encoding information and services with meaningful structure and semantics which computers can instantly recognize. XML is superior relating to other web publishing format due to its flexibility, versatility, scalability and ability to be validated. XML can transform any document from unstructured format to structured, dynamic, functional format making it more extensible and reusable to be utilized with Web applications. Data Entry Help a leading offshore BPO service provider can deal with large-volume XML data conversion projects to convert documents from almost all recognized digital formats along with hard copy documents to most flexible and reasonable XML format of the utmost quality. Data Entry Help has been successfully accomplished a wide range of XML conversion projects for publishers, banking, Universities, e-commerce, healthcare, Libraries, ITES, Corporations, Government Organizations, legal, marketing and research, manufacturing, publishing, real estate and Technology companies globally. Data Entry Help perform XML Conversion of digital content, books, magazines, journals, manuals, manuscripts and other documents. Data Entry Help can also undertake other services like development of XML DTD (Document Type definition), XSD (XML Schema Definition), conversion specification and validity check for XML etc.